99 min. The Weinstein Company. Director: Simon Curtis (II). Cast: Michelle Williams, Eddie Redmayne, Kenneth Branagh, Julia Ormond, Dougray Scott, Judi Dench, Toby Jones, Emma Watson, Dominic Cooper, Derek Jacobi. If you liked Me and Orson Welles, consider yourself the target audience for My Week with Marilyn, a mostly frothy glassful of awards-season nog. I'll confess up front that My Week with Marilyn—derived from Colin Clark's diaries of sharing time with Marilyn Monroe—inhabits guilty-pleasure territory for lovers of Old Hollywood. Amidst the film's showmanship, though, director Simon Curtis proves capable of some subtle points; plus, he has four aces in the hole: Michelle Williams as Marilyn, Kenneth Branagh as Sir Laurence Olivier, Tony Award winner Eddie Redmayne as Clark, and Dame Judi Dench as Dame Sybil Thorndike. In 1956, Clark actually spent a summer in Marilyn's orbit, in his capacity as third assistant director on the 1957 comedic film The Prince and the Showgirl, directed by Olivier. But the week in question refers to Clark's brief, rather chaste fling with Monroe, which the screen Clark describes, in words lifted from his kiss-and-tell memoir, as "a few days in my life when a dream came true and my only talent was not to close my eyes." Curtis' film lovingly dramatizes those golden moments, but also serves as a backstage farce about Olivier's war with his leading lady. In many ways, My Week with Marilyn is tough to defend. It surely exaggerates Clark's access, making him fly-on-the-wall privy even to private squabbles between Monroe and her famous husband Arthur Miller (Dougray Scott), and Olivier and his famous wife Vivien Leigh (Julia Ormond). Screenwriter Adrian Hodges also tells when he could show and needlessly pulls some punches, filing some of the edges off of Monroe and even, in the end, the prickly Olivier (who reportedly took his grudge against Marilyn all the way to the grave). But Curtis' film is also a certifiable hoot and capable of scoring genuine emotional points. Williams gives a brilliant performance (more on that anon) and Branagh a technically impressive, highly amusing one, while the period recreation of a tightly budgeted British film production charms (not least in Dench's endearing turn as the generous Dame Sybil). The notion of a star living on the pill-popping edge resonates with the headline-making case regarding the involuntary manslaughter of Michael Jackson and, inevitably, the untimely death of Heath Ledger, the father of Williams' child. In one of the film's best scenes, Clark asks Marilyn why she doesn't walk away from her career, since it seems to make her miserable. "You could be happy," he insists. "I am happy," she replies, all evidence to the contrary. But it's an accurate paradox, one of the many contradictions of the artist "unfortunate" enough to become a star. Much of the story's tension comes from Marilyn's sincere desire to master the "Method," represented by her personal on-set acting coach Paula Strasberg (Zoë Wanamaker). The old-school Olivier fumes while Marilyn struggles to motivate a cardboard comic character. Williams is better than the picture, but within the screenplay's constraints, she nails every possible nuance of physical and emotional expression. It's dazzling work, and reason alone to spend ninety-nine minutes "with Marilyn." 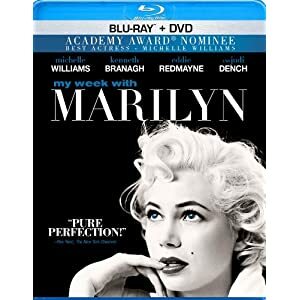 Anchor Bay's Blu-ray + DVD special edition of My Week with Marilyn delivers a fine hi-def presentation that's faithful to its source material. The picture retains a filmic feel, purposefully a bit softened in its evocation of period (and, indeed, period cinema); aside from a bit of banding, the transfer is excellent and includes all of the detail seen on theater screens. Color is far richer than standard-def can manage, and black level is impressively deep. The DTS-HD Master Audio 5.1 mix proves just as effective at recreating the theatrical experience: it's a nicely clean track with some oomph to its musical sequences and some lively ambience when called for by the proceedings. Since this is mostly a talky experience, dialogue prioritization is key, and thankfully well-handled. Special features include an audio commentary with director Simon Curtis, who gives a measured (and a bit dry) accounting of the film's making and his viewpoint on the material. The rather cursory featurette "The Untold Story of an American Icon" (19:07, SD) touches on the historical roots of the film, the character of the principals, and the making of the film. All site content © 2000-2019 Peter Canavese. Page generated at 04/17/2019 04:00:17PM.